If you have found this page you probably have a good hunch about what a nokota horse is, if not I recommend you to visit The Nokota® Horse Conservancy and read all about the Nokota horse history and the work to save and promote the breed. The Kuntz Nokota horse ranch is where it all started. 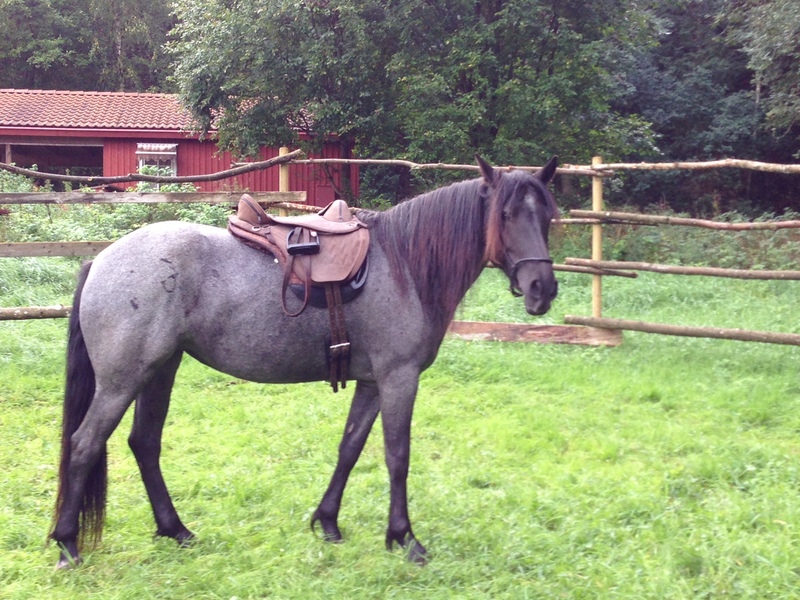 You must also visit the blog of The Zeigler Family and their nokota horses in North Dakota and in Örnsköldsvik, Sweden. Bluebell Star, the lead mare in our small band. She was born 2008 at Leo Kuntz ranch in Linton, North Dakota. 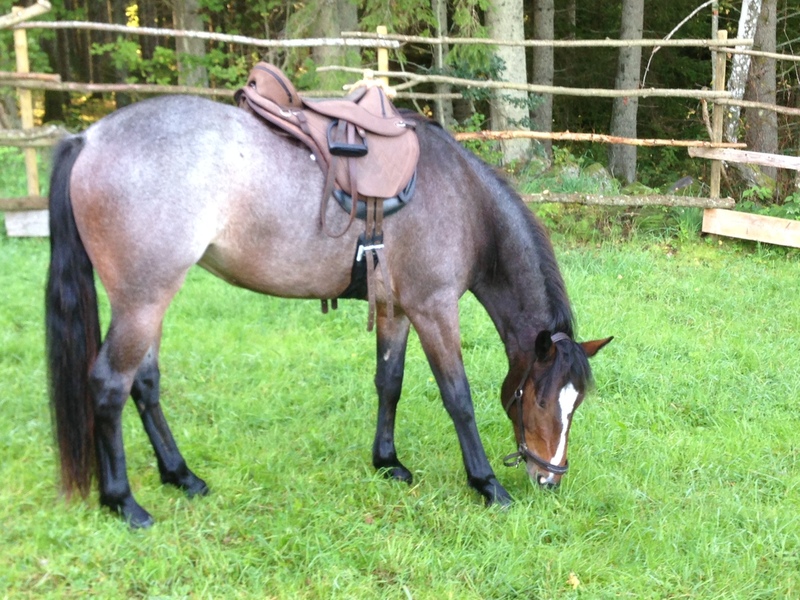 She is a dark blue roan by Sharpie and out of Black Spotted Socks. She is so fine and gentle but also alert and full of energy. She keeps the other horses in good shape by daily bucking and racing competitions around the field, just for fun. She is very straight forward and easy to communicate with, and she is very curious about new things. Windflower Dancer, our dark red roan, was born 2010 also at Leo Kuntz ranch, by Blue Wolf and out of Keen Dancer. 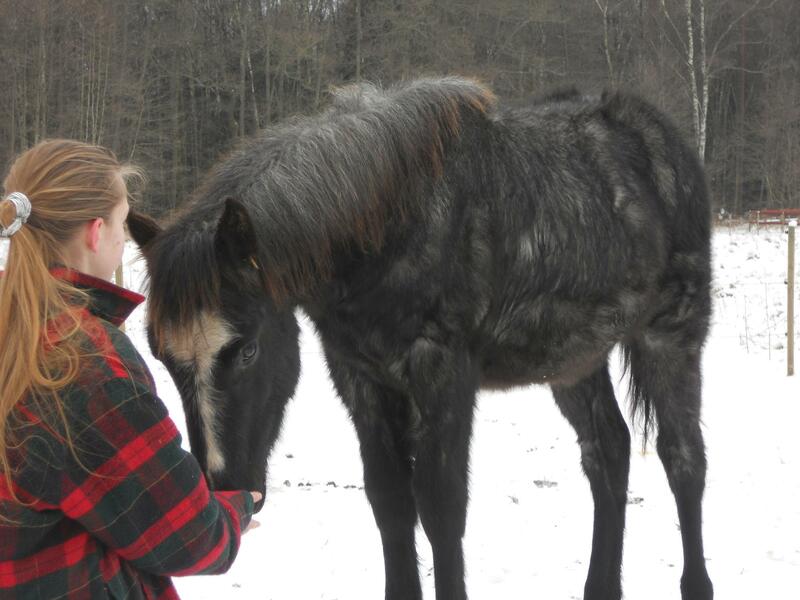 Her winter coat is thick and soft, sparkling with dark red mixed with white underneath and some bluegrey. Her face is sweet with a white stripe and big brown eyes. She is a tough girl full of confidence, but she gives Bluebell full support. She is also very easy to be around and she likes attention and cuddling, which she gets by pretending to be shy. Alexandra has come a long way with her in all aspects of horsemanship. Wild Prairie Rose was born 2011 and also by Sharpie, but out of the famous Lucky Dust, an extremely wild nokota that was saved from the Theodore Roosevelt National Park in 2003 along with her father Wanblee, a beautiful blue overo. Both were probably the last true nokotas that was saved from the park. Wanblee´s father was the little black traditional nokota called Midnight that escaped the 1986 roundup by charging against the helicopter. No wonder our little Wild Prairie Rose is so confident and brave despite her young age. During the quarantine time Seth even talked her into a small tent during a windstorm. Wild Prairie Rose is a light blue roan with some silver in her tail and mane, mixed with a few red hairs. We wish to thank Frank a lot for the opportunity to provide for her future here in Sweden. Tack själva! Det var roligt att träffas igen. I learned even more then I knew about this bread. I look forward to following you. What beautiful animals! Thank you for stopping by barnyarn. What a delightful and fascinating blog – thank you so much for visiting mine, and leading me to yours! I have a lifelong passion for horses, but sadly can’t afford to have one of my own; I shall be content to enjoy yours at long distance, though! I’m especially interested in your horses and their story because when I was younger (MANY years ago now!) I made three trips to ranches in British Columbia and gained an everlasting respect for the ranch horses, and people, of the West. Part of me would still love to be a cowboy! Congratulations on a fine blog, and the fantastic work you’re doing with these beautiful horses. Thanks, and yes it’s hard to imagine a life without horses now. Love your blog! Thank you for signing up to follow me! I hope that I will entertain you with articles on food, life here in the Sierra Foothills of California and with my photography! Take care and thank you again! Seth, these mare’s are beautiful! Especially Wild Prairie Rose! (I’m a sucker for a Blue Roan 🙂 ) I saw that picture of you coaxing her into the tent. I’m looking forward to another trip out to see Dale, Holly & the Nokota’s when I get time off work. Still hoping to make it to North Dakota this summer sometime. (23 hrs from my house to Kuntz ranch) I can’t wait to see them as close to their natural setting as possible until the conservancy can buy them the land they desperately deserve to run free. What a wonderful blog. Thanks for visiting mine. and viewing my post on change and the wild horses of Schiedam Flats. Shuswap Nation (http://www.tkemlups.ca/our-story/our-land) Reserve on which I live. I love your blog! And, the horses too! I meant to get back to you and thank you for visiting my blog, but not before I had a chance to dive deeply into yours. And that took a while. So at least my tardy reply has a valid reason! Will be eager to follow your progress with the Nokotas. I am a Native American photographer from the U.S. and feel so grateful to have discovered your blog and to read about the great work you are doing to save and promote the Nokota’s. My heartfelt thanks for all you do and for helping to educate others. Thank you very much, Sir you are welcome. This is one comment we will save in our hearts! Very interesting stuff here. Not sure how I got to your blog but I did and will be diving in to explore very soon. Thanks for liking my post! Your horses are beautiful! Thanks again. thanks for liking my recent post. There are a lot of farms near my home where horses are bred. Your blog inspires me to get out and take more pictures of the horses in my area. We’re glad to have found your blog too, Eddie! Thanks for visiting my blog – now I know a little about Nokotas. I hadn’t heard of them, but after reading a little they remind me of the curly horses in Nevada. You are doing wonderful work! What a lovely blog! This horses are just gorgeous. I enjoyed looking at your site. We have some things in common. I live on a ranch and took Swedish in college, but please don’t test me as jag kan inte tala Svenska mychet bra. We are in northern Colorado. Last summer we visited the Pine Ridge Reservation and Crazy Horse Monument in South Dakota. 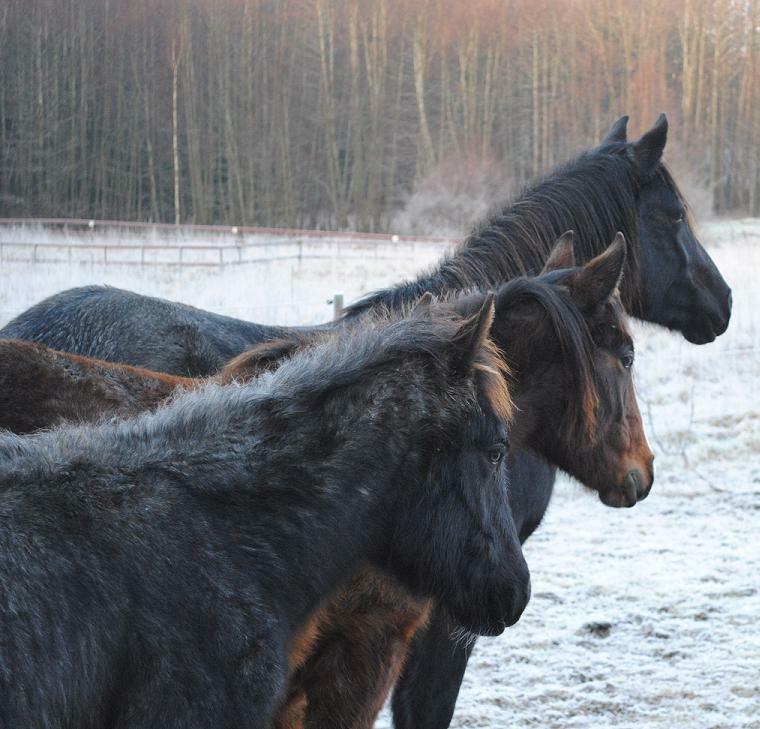 It is interesting to me that Swedes are preserving Lakota Sioux horses. Thanks for your good work with the horses and for educating us. I am here to discover the Nokotas. I have lived all of my seventy years with no knowledge of them. If Rick Braveheart thanks you, your work is important. I am excited to discover these majestic animals from our past. I thank you too. I love the look and the description of the Nokota horses. Such beautiful animals. If Rick Braveheart thanks you, your work must be important. I thank you too. I nominated you for the Sunshine Award! Your blog is amazing. Every girls dream to have horses and you have so many. I love them and how much they look like pets to you. Your photos are lovely. Vilken tur för mig att ni gillade ngt jag skrivit på min blogg 🙂 Hade ingen aning om att det fanns dessa hästar, men nu gör jag och kommer att läsa med stort intresse och nyfikenhet! 🙂 Du är så välkommen så! Thank you kindly for the “like” of my story “Pastime”. I can see you have deep respect and a passion for these wonderful creatures. Best of good fortune to you and your work! Thank you very much, it’s our pleasure! You have beautiful horses. NIce blog. Very interesting reading about the Nakota. Thanks for following The Sundog Drift. I would like to follow you too. Thank you so very much, what a great honour! Now we are curious about your book … and about the quote. I hope you’ll purchase the book . . . your quote is on page 152 in this Chapter: Equine Theologian. PS Buy one for everyone on your Christmas list!! Wonderful blog. They look very much like my Cooper that I’m trying to do dressage with 🙂 He’s very dark blue roan now, but come spring he lightens up just like them 🙂 Ha det så bra! Thanks, you have a nice blog with many interesting subjects, as the Lakota. Our horses has a historical connection to them.